Supplier & Manufacturer of FRP Fans & FRP Fan. Our product range also comprises of Industrial Towers, Industrial Boilers and Industrial Vessels And Storage Tanks. These fans are widely required in air cooled heat exchangers and cooling towers. 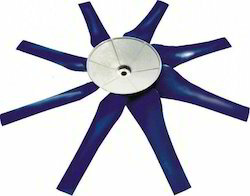 Driven by perfection, we are engaged in manufacturing and supplying a quality range of FRP Fans. Widely used in air cooled heat exchangers and cooling towers, these FRP fans are manufactured in accordance with industry laid guidelines. Along with this, our experts strictly monitor every stage of production, so as to maintain higher quality standards and remove defects, if any.